New attribute: series can be applied on the cafd node level, or the code level (takes precedence). New attribute: author. This will make it easier to maintain the XML and can be used as filter as well. For the series, I'm looking at available series inside CAFD. For example, F020 covers F20 to F23, and F30 covers F30 up to F36. I'm still debating whether individual series makes sense, i.e. F25, F32,...etc. Also, Activating Condition will be available too. It's useful to some, but will not be for most. It's just too much information for the most part. First of all, please do not request download link from this thread. We have a thread for that. Note: Looks like the video is blocked in Germany due to my background song. As far as I know, it was royalty-free. I didn't expect this feature to be a hit as most of us already know how to code, but I got several emails asking about it. One question stands out among the rest, though. "How do I edit it/add to it?" Well, I did design it with full customization in mind. My hope is to have a file maintained by the community and people contributing to it. So, let's get to the details. 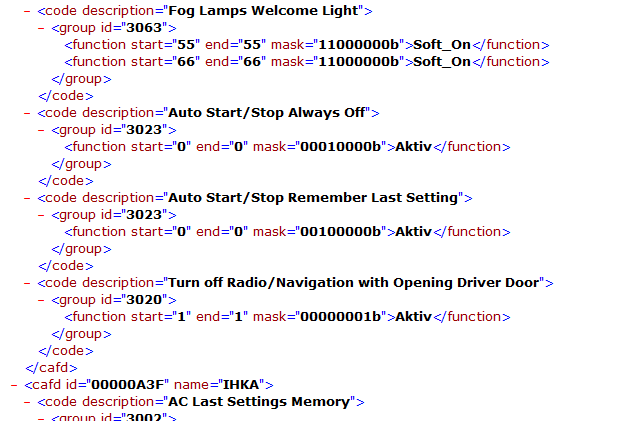 Cheat codes are stored in an XML file, in "FDLCodes.xml" to be exact. The format is simple and I didn't enforce any schema-check, although I might in the future. Root element is FDL and grouped by cafd. Each code is enclosed by code element and the actual items to be coded in group-function hierarchy. 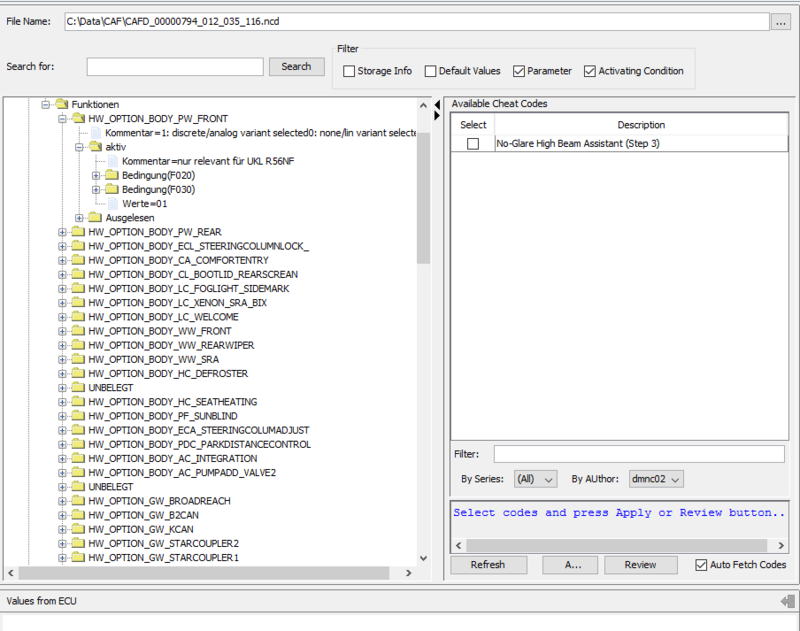 The cafd element must have the id attribute and must correspond to actual CAFD ID. The code element must have description attribute and is what is shown in the table. The group element must have an id and this corresponds to the datagroup (or daten) in CAFD. Example: 3000, 3020, 3060...etc. The function element must have start, end and mask in addition to the actual value. The value can be literal (LEGAL_DISCLAIMER_TIME, TCM_MSA_MEMORY...etc.) value or Werte value (00, 32, 64...etc.). functions must be inside a group and a group can have many functions and codes can have many groups, as shown in the above image. Using names would have been easier but it will a headache to maintain. Codes are few but I hope we'll add to it. Changes to FDLCodes.xml can be seen immediately by refreshing the codes (click Refresh button). There's no need to restart E-Sys or the Launchers. 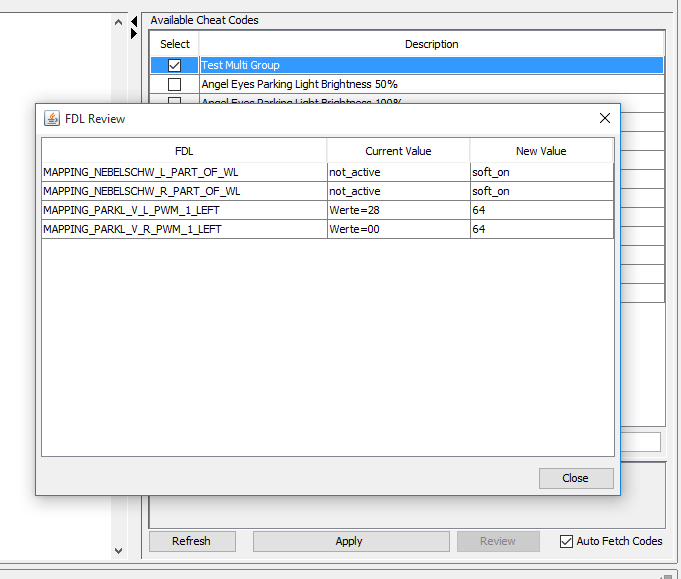 As there are features that affect multiple ECUs, stating it in the description is a great way to notify users, i.e., FEM/ICM/EGS or Part 1 of 3...etc. Last edited by TokenMaster; 10-21-2015 at 10:36 AM. Thanks for the info, TM. So if somebody wanted to add the cheat codes for, say, enabling no-glare high beams, what should be the procedure? Should the .xml files be submitted to you or do you envision people simply posting modified FDLCodes.xml files on the forum with additional cheat codes added? I think that no-glare high beams would be a perfect candidate for this, since it requires editing multiple Werte value directly because the literal values are not mapped consistently (e.g., multiple "Unknown" values associated with different Werte values) and this is quite confusing for people who are new to coding. Also, a question that has been asked on the other forum is whether it would be possible to have the option to undo individual cheat codes (without VO coding and starting all over again). Last edited by dmnc02; 10-07-2015 at 12:04 PM. I think posting the modified XML here is better. That way, I won't be the bottleneck and people can just download and use them as they see fit. And I'll merge them with my copy and make it part of the next releases. I can't make the cheat codes like a toggle, where it will be applied when you have it checked and removed when unchecked. Too many possibilities that it will be more of a problematic feature than a useful one. Having said that, you can create a new code with default value/s and state so in the description. That way, you have a code with default value/s and another with custom value/s. Last edited by dmnc02; 10-08-2015 at 09:30 AM. Awesome. Post your Cheat .xml file please. This is limited though to pre-Lci F3x and F8x with LED Light's correct? I need to check one thing with TM regarding Step 3 (which involves FEM_BODY) and then I will post the complete .xml file. This applies to all F3x/F8x other than the F30/31 LCI. There is one forum member here who has a 2016 X5 with the FLE ECUs and who is ready to test if the coding still works with those ECUs, but unfortunately his car has been at a body shop for the past two weeks: he should have it back early next week. If everything works on that car, everything should work on the F30/31 LCI as well. I guess GHB for Xenon's are a lost cause all together. And then I am not even sure about others like F12/F13, F01/F02, and F06. My point though is if we start publishing and sharing Cheat.xml files we need to Label / Name them or otherwise note exactly what it is for. I do think at this point that there is no hope for Xenon's. 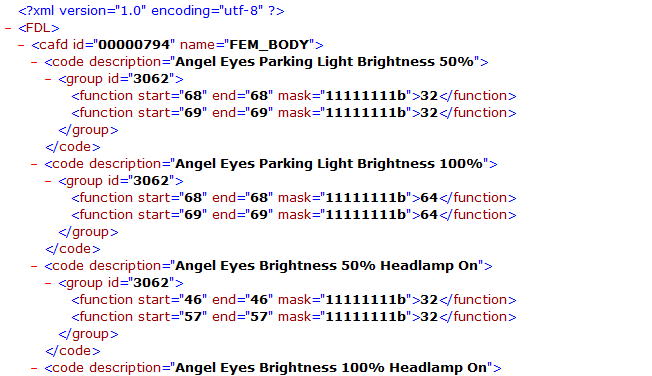 The LED headlights have not changed on the 2016 F3x/F8x and the coding has been confirmed to work on the 2016 F3x/F8x that still have the LHM+TMS ECUs. For whatever reason, the 2016 F30 and F31 now have the FLE ECUs instead of LHM+TMS: however, the relevant portion of the coding files for the FLE ECUs is similar to that for the LHM ECUs, so I am hopeful. Just (US) VO coding seems to work on the F10. I know nothing about F15/F16 up to 2015, but we will be finding out next week about F15/F16 that are 2016 or newer. maybe I am being paranoid and don't understand how it works? Merci à nouveau pour ton travail ! one solution, is to have a "trusted" review team that is responsible for accepting contributions as well as merging the contributions to the different versions of the file as was eluded to above. Last edited by aboulfad; 10-08-2015 at 02:38 PM. but i have problem with Codes with 2 group ID. in my case when i code in ESYS only code the first Group ID. Second not mod values. Please check if in your case work good this functions. Last edited by ruben_17non; 10-08-2015 at 06:26 PM. But i 99% sure, FDL coding from Cafd Values. not afect to security. This is same as coding FDL with normal esys, with custom values like Werte FF for speedlock. This is good for fast code, but the way and result is same as manual coding with esys. Last edited by ruben_17non; 10-08-2015 at 04:00 PM. Ola ruben! maybe the word malicious intent was not understood. That means someone that is not nice and shares a file, but modifies the values in such a way to cause harm. Example, someone contributes a DSC EuroMDM cheat sheet (very popular) but codes one of the parameters incorrectly on purpose. That's only one example of many where harm can happen to someone or their car. I hope my point is clearer now. Yes, cheat codes is an easy way, equivalent to doing it the manual way, but the risk here is that you are no longer coding it yourself, rather relying on someone else that provides you the cheat sheet. I am not entirely sure if this is plausible scenario, but given TM's primary concern is security I thought to mention it. Or you do not know how to code and are unwilling to learn, in which case your only alternative would be to rely on somebody else to do it for you: in this latter case, a file that is posted on this forum and subject to public scrutiny is a much safer alternative, at least IMO (unless, of course, you happen to live in the same town as Shawn). Last edited by dmnc02; 10-08-2015 at 05:00 PM. But is easy of check, just read ECU for example NBT save backup. use fdlcodes.xml apply changes, after this just compare changes from fdl mod with original backup. if all is ok, New codes are Checked and confirmed. is fast way. PS: I removed my contrib as the powers be decide what EuroMDM settings are proper for the F8x platform. Last edited by aboulfad; 10-10-2015 at 11:11 AM. As already pointed out by dmnc02, files posted here will be at least reviewed by somebody else. The XML file is also readable, thus, is easily verifiable. And if it so happened that an XML with wrong values are released, it is completely reversible by VO coding. And you can be certain when that happens, that you will be using legit files to restore your car. Lastly, another release will be out soon, hopefully, later tonight. As you have tested, only the functions from the first group is being read. This will be fixed. before i check estructure of xml, and for me appear ok, but not work second group ID i imagine is a little bug. Perfec you fixes itt! ansious for try new version. Thanks! maybe the only "big" problem will be with any value of Voltaje, is it is high, this can make damage, but the rest is easy to fix restore with code VO. If new codes are posted in this thread, for First use The best way is verify codes, before FDL Code. Last edited by ruben_17non; 10-08-2015 at 08:30 PM. V2.4.2 is now available. It fixes the parsing issue when there are multiple group nodes in a cafd element. NOTE: The codes in the images are test data only. Please do not use them. Thanks TM for the new revision. Turning the amber sidemarker LEDs on/off, as described in this thread. Requirements: E-Sys Launcher v.2.4.2 or newer, F3x/F8x with LHM+TMS ECUs (this includes all F3x/F8x model other than F30/31 LCI), LED headlights (option code 5A2 or 552). In addition, the activation of No-Glare High Beam Assistant requires Adaptive LED headlights (552) and High-beam assistant (5AC). There was one another annoyance during the coding, is the maske field is not selectable, so you cant copy it, and have to guess how many trailing ones or zeores there are ... Thank you ! For a variety of reasons, I think it would be helpful when people post files containing codings that are not part of widely used Cheat Sheets to also provide a link to the source from which the codings are taken. Last edited by dmnc02; 10-09-2015 at 12:06 PM. Yes good idea, hence why I provided the source I know of inside the file itself for the xxxxMDM feature as well added a small header. I am not sure if it's ok to post links to other forums, hence why I didn't do it directly in the thread.